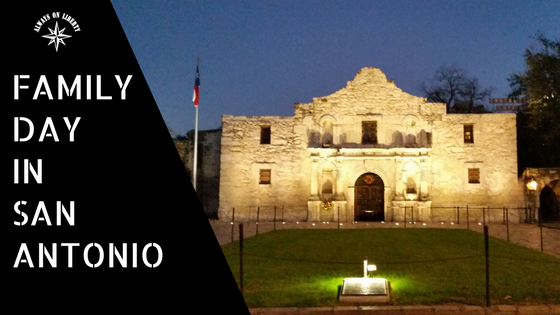 Being our visit in the San Antonio area was drawing to a close in 2016, we were jam-packing excursions that we we’ve seemed to either overlook or time simply caught up to us. 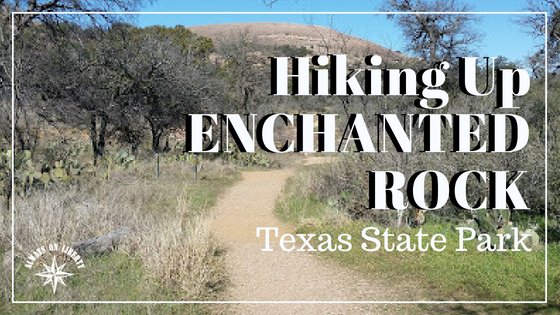 One of our must-do places on our list while in the area was to go hike Enchanted Rock. 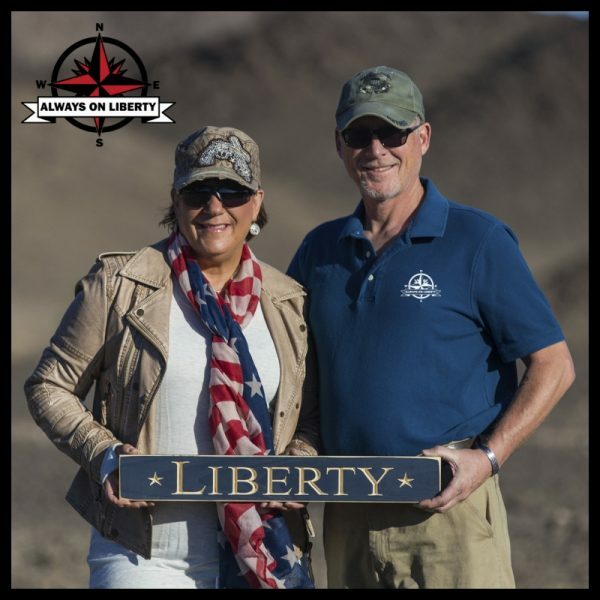 In 2016, about a month after our son returned from his fourth and final Middle East deployment, he drove down from his home and duty station in Colorado to come check out our new digs and visit for a few days. We bragged about how wonderful San Antonio was and that he just had to come check it out for himself. Unfortunately, his fiance’ couldn’t get time off from work to come with him but we made the best of his visit. 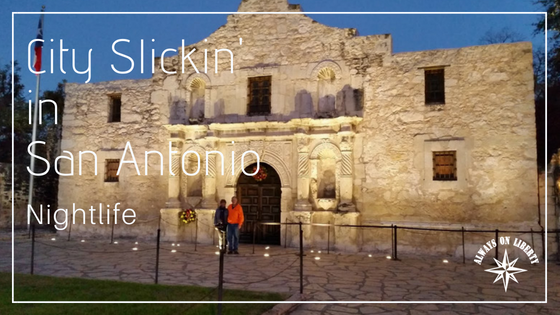 City Slickin’ Nightlife in San Antonio! 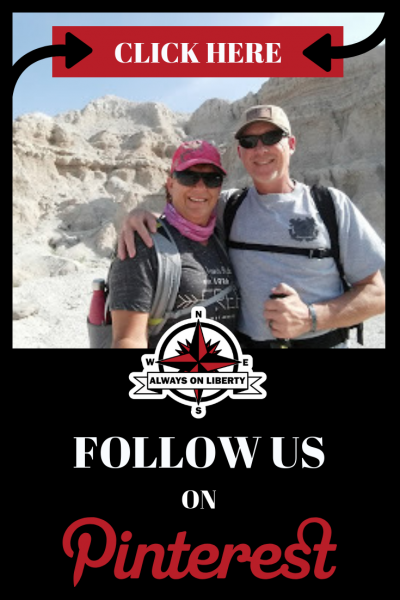 We chose to spend the winter near San Antonio, Texas in 2016 to spend with our Army friends, Leon & Barb, who were stationed at Fort Sam Houston. We met them when we were all stationed in Louisville, Kentucky. But it was a double bonus because we’ve never been to San Antonio. The sea, once more, called our name. The salty beaches, seafood lunches, sand between our toes and an occasional grog to close the evenings were just what the doctor ordered. We chose Galveston Island because two Coast Guard shipmates live in Texas City and another who lives in Katy. 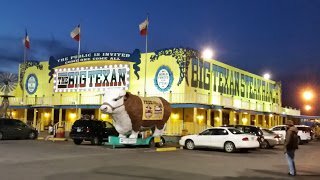 Always On Liberty Crew goes to the BIG TEXAN!! hurt and will give you a salad…and laugh at you. No, really, its true!! You can’t miss the plentiful billboards of I-40 near Amarillo, tourist brochures in every establishment and of course the huge yellow building with the big, truck-size steer in the front of the building on Route 66 with Texas flags flying. They say it’s a ‘Landmark Legend’. The place lights up like Christmas! I bet Rudolph has no problem finding it to deliver Santa for a quick bite. 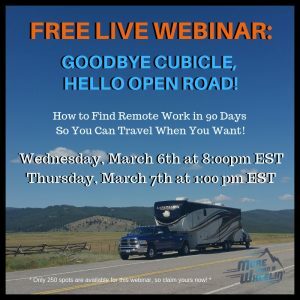 They even promote by offering free limo rides to and from the RV park. Their limo cars all have huge ‘long horns’ on the hoods like Boss Hogg’s car on the Dukes of Hazard. Its no exception, they too, do everything BIG here. Its a Texas thang. I mean, LOOK at that place!! So what are two former Pennsylvania carnivores, who know their beef, to do while we were in Amarillo?? 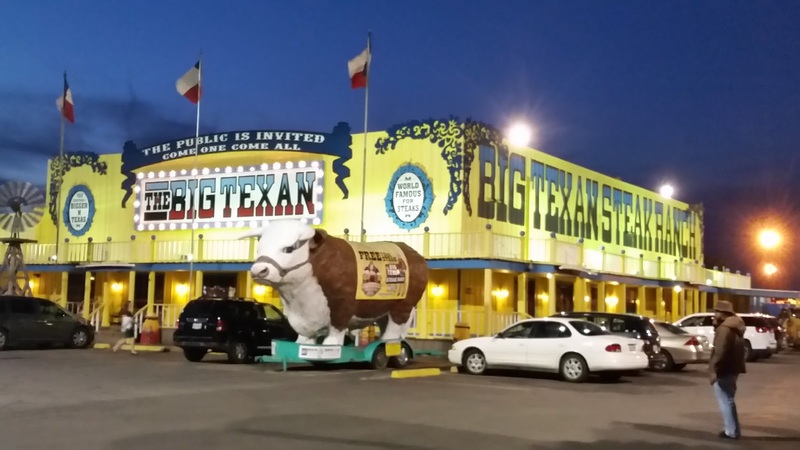 We ‘fine dined’ at The Big Texan Steak Ranch, of course! We were met at the door by Cowgirl and Cowboy waitstaff, all decked out in their plaid shirts, stetsons, boots and spurs, who took us to our table. There was nothing formal in this restaurant so leave your pearls at home; you may get some bbq or steak sauce on them. steak…and all of the fixins that went with it (salad, baked potato and roll). Well, we can’t remember if he beat the challenge but we remember his bragging about this meaty restaurant; we just had to go. Anyone who beats the challenge (there’s actually a special raised table at the front of the restaurant with big digital clocks and tv cameras to record it…even!) gets to walk out without paying the bill. Imagine that! How easy would that be? 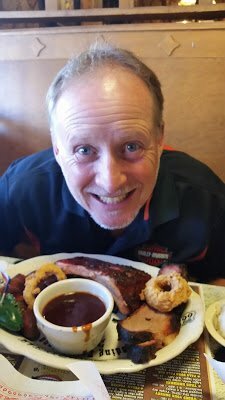 Well, we didn’t have the kajones nor the appetites to take on the Man vs. Food challenge of the 72 ounce steak dinner however, we started with the perfectly crispy fried ‘shrooms with awesome secret sauce and then to our entree’s of BBQ ribs and the 24 oz. steak dinner and went home with people bags (if you don’t have dogs or even if you do, they’re not doggie bags). Our meal was absolutely delicious! 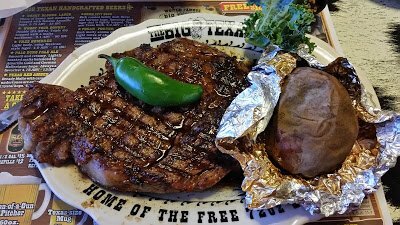 The steak was outstanding; perfectly cooked in my requested medium-rare with a steamy, plump baked potato and see that pepper thing on the steak? Was I supposed to chow that down too? I had the salad prior as part of my meal. 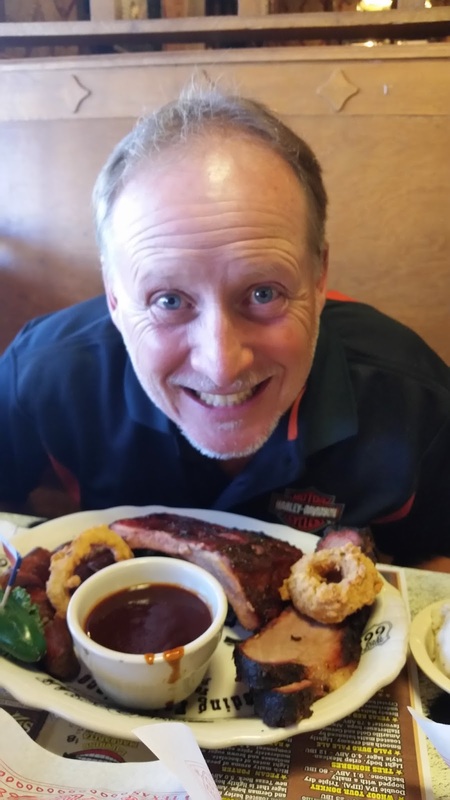 Dan had the ribs slathered with fantastic BBQ sauce and crispy onion rings; also had a big honkin’ salad prior. We were happy campers with our meal and the waitstaff was on the ball with our beverages. We’d give this awesome peculiar steakhouse a 5 out of 5 stars. It was THAT good! The steak was criss-cross charred exceptionally and melted in my mouth after only a few chews. It came from a good cow…or bull. I still can taste it just looking at the pictures! Oh! OH! They even have this roving Texas country music version of a Mariachi Band. We politely declined; something about someone else singing for our supper makes us willy-nilly. After we satisfied our growling bellies, we waddled our way into their most awesome gift shop of ‘Texas Everything’; jewelry, purses, commodities, souveniers, t-shirts, trucker hats and even a live-caged huge rattler in the back of the store (Ew! Ew! Ew! EWWWW!!!). 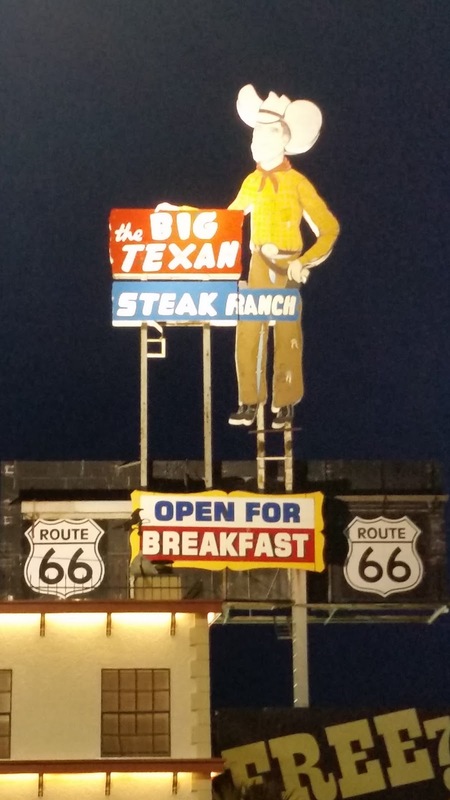 We came out with a couple small tokens of remembering the Big Texan Steak Ranch. They got it right, there; meat for the guys, shopping for the girls. Smart marketing, I’d say! So, if you’re into carnivore-ing like us, definitely set your GPS to the BIG TEXAN Steak Ranch. Its an Amarillo favorite! They also serve breakfast there too!! Your tummies will thank you…and US for the “bulls-eye” (ha ha! See what I did there?) recommendation. 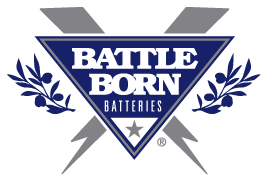 If you’re nowhere near, go to their “beefy” website (whoa! Did it again!) to get look-see. 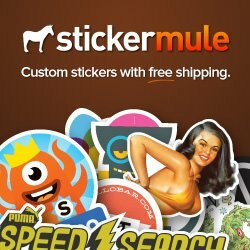 Too bad they don’t make scratch and sniff websites! So there’s our review. We were not compensated for telling the truth. Since we were little kids, We’ve always wanted to go to Texas. We remember watching black and white tv shows that were filmed in Texas. I love big shiny belt buckles, cowboy hats and boots. Both were enamored watching gunslingin’ heroes with big shiny revolvers. 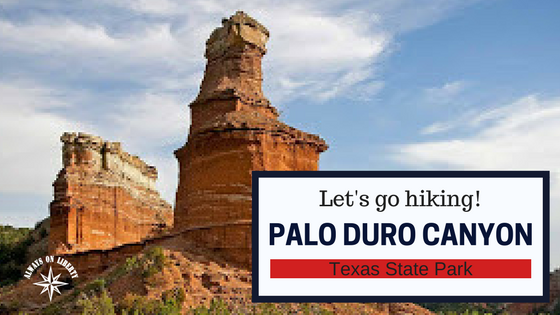 Equally, we love all things Texas; cactus, armadillos, cowboys (not the Dallas team) and the big stars in the big Texas sky. Oh, and let’s not forget my favorite, the King of Country, George Strait. 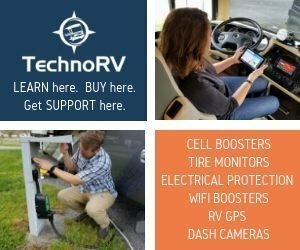 Oasis RV Resort was recommended to us by another RV’er but we didn’t realize the extent of their recommendation. 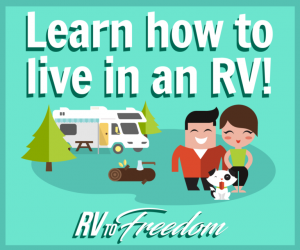 Its been rated as one of five top RV Destinations in Texas. We made a reservation a month prior. 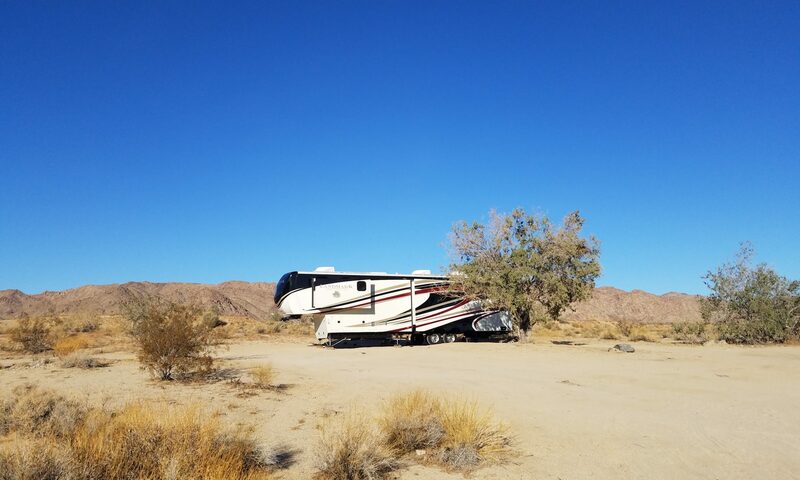 This RV ‘Resort’ is beautiful! 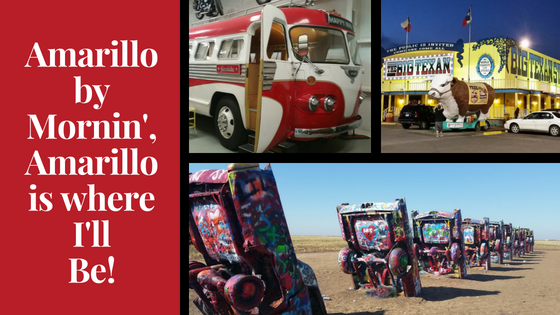 Oasis RV Resort is located west of Amarillo and is easily accessible from I-40 (exit 60) and only 2 miles from Cadillac Ranch on the Service Road. Campground signs signify a mile from the exit; as well, a huge billboard showing their location (lit up at night!). Love’s Truck/Travel is right at the exit for easy fueling before you park or on your way out. This very manicured RV Resort has 188 concrete/asphalt level, ample spaced sites; 147 are long Big Rig friendly pull-throughs. Large chipstone islands between each site instead of grass; however beautifully manicured gardens and grass in common areas. Check-in procedure was fast and friendly. We arrived at 3:00pm with no waiting. 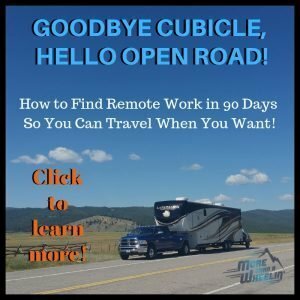 We LOVED this RV Resort!! It, so far, has been our favorite in 2015! So much to do nearby! We spent a couple evenings enjoying their adult heated spa. This RV Resort earned our 4.75 stars (out of 5). The only thing missing is an adult beverage area (clubhouse) open at least weekend evenings. Also, the pool could have been open a couple more weeks as it is still quite warm outside. Campfires are not allowed; even propane firepits. LOVE the fact that they honor Active Duty Military with their first night stay for FREE! We put this HIGH on our list of returns! Love this Resort!